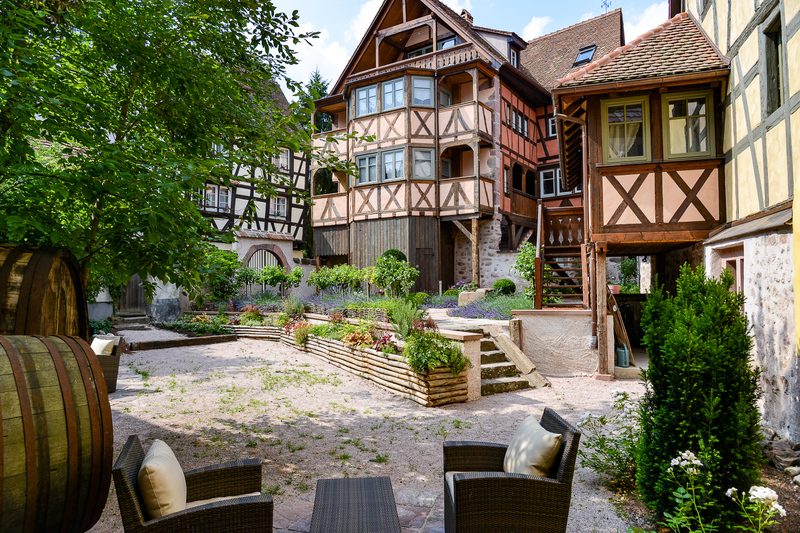 Fox and Grapes 4 star holiday apartment for 2 persons in Riquewihr, Alsace. The "Fox & the Grapes" is aptly named. 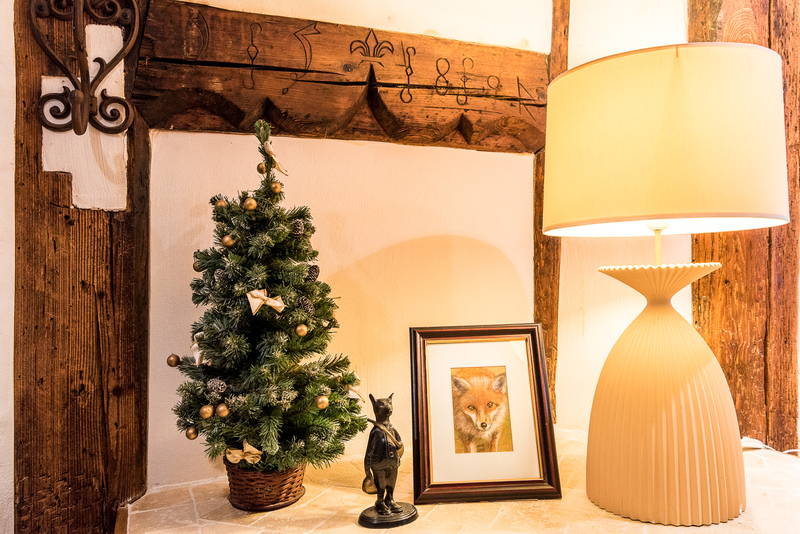 The famous Fox has always been around Riquewihr, on the paths on the edge of forests and vineyards. In the French classical literature there is a famous fable by Jean de la Fontaine called the Fox and the Grapes. 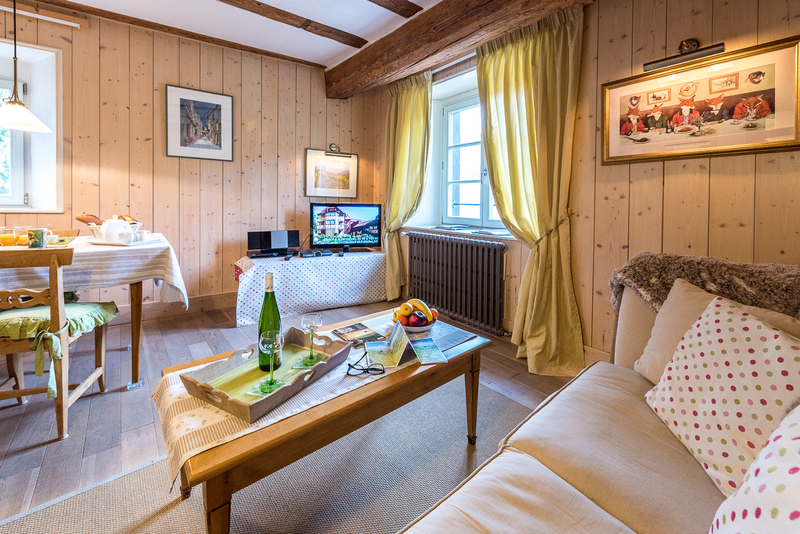 The nod to the fable is even easier than this charming apartment, romantic and comfortable to perfection, has a great location, on the first floor of our big Renaissance house on the ramparts of the year 1291, with stunning views over the famous Grand Cru vineyards of Schoenenbourg. 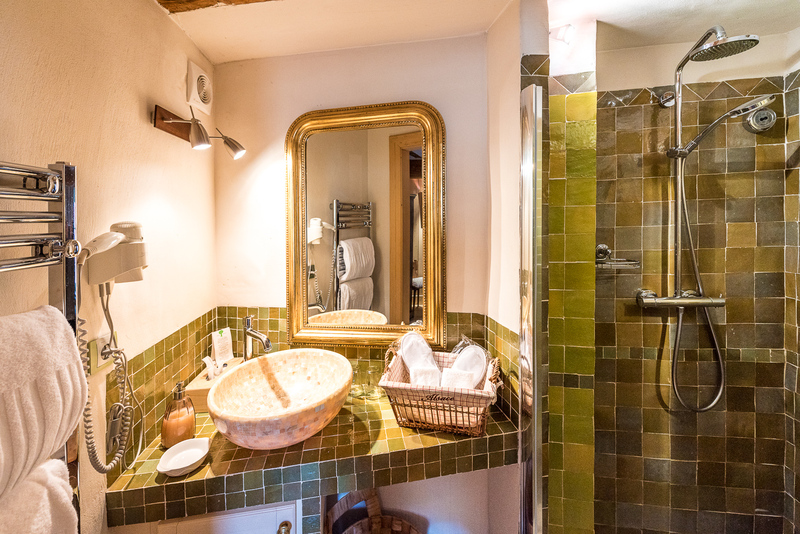 This holiday apartment (gite) is ideal for a stay in Riquewihr, in any season, especially for those interested in wine and vine work. In fall, you will have front row seats for the harvest! Thanks to its west and north direction, the apartment has both a good light (sun in the afternoon) and a remarkable natural air conditioning, particularly pleasant in summer. 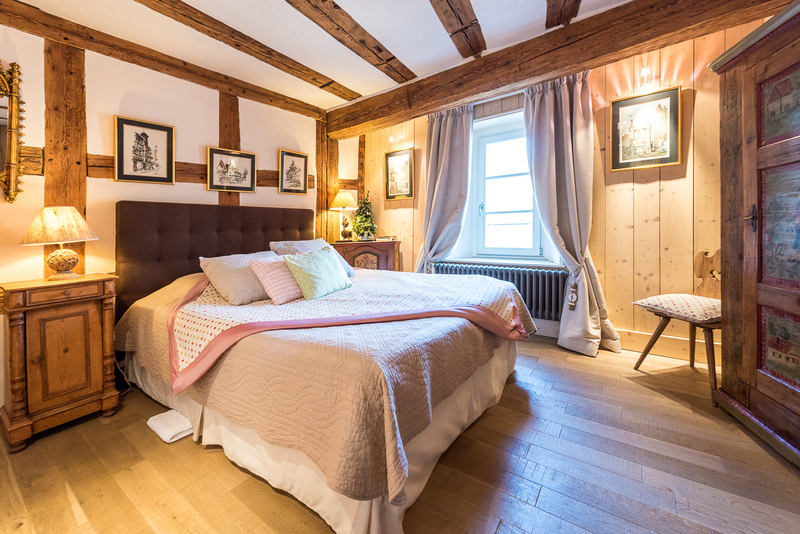 The outer wall of the lounge and the bedroom is none other than the fortified rampart built in the year 1291! This is where the defence walkway passed. Thus, at a time when responsible people are worrying about energy savings, it seemed quite unnecessary to install air conditioning. In winter, well protected behind its thick walls, this apartment retains its warmth, in a particularly pleasant manner. 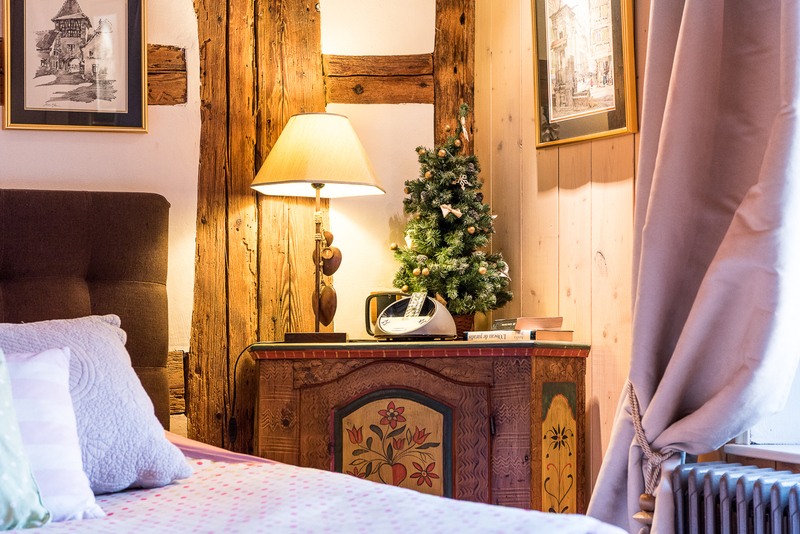 Decorated with a palette of pastel colors combining pink, green and beige, the gite "Fox and the Grapes" offers harmonious spaces, perfect even for extended stays. 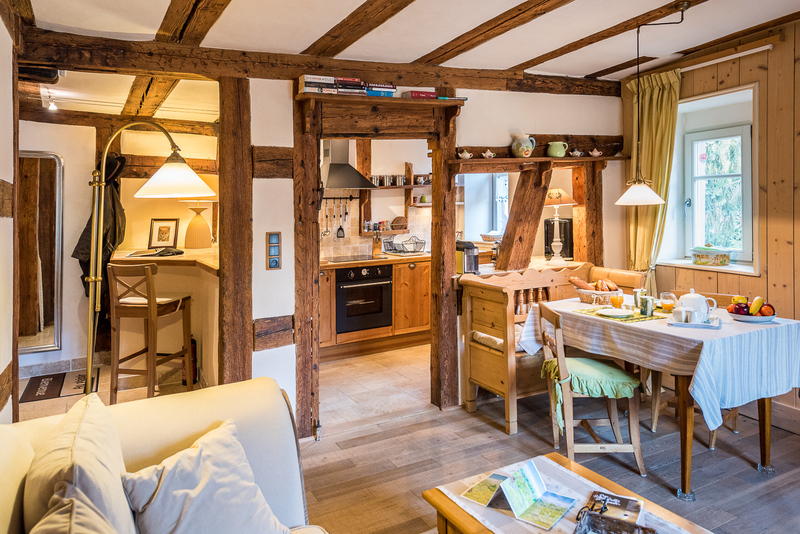 Just behind a old timbered opening onto the lounge is the dining area: simply reach out to catch the toast! 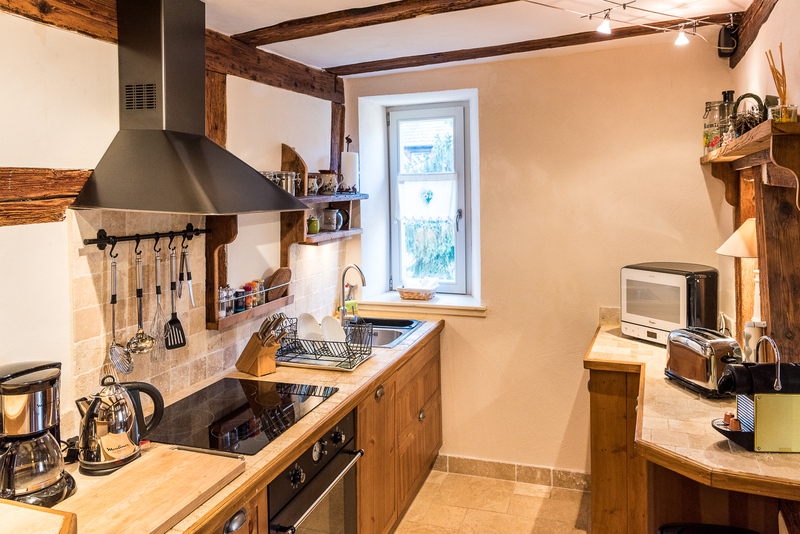 On the other side, a small bar area allows him (or she) who is not allowed into the kitchen to continue the conversation with the master chef while enjoying a delicious wine from Alsace! In the lounge, an elegant sofa invites to relax before the flat-screen TV while keeping an eye on the vineyard. After a busy day of sightseeing and excursions, the bedroom, romantic and luxurious, offers a very comfortable queen size bed. A charming bathroom with shower completes the cozy bedroom. Old timber, wall paneling and solid oak flooring create a warm atmosphere and help make this lovely apartment a place to stay in any season. And do not forget. 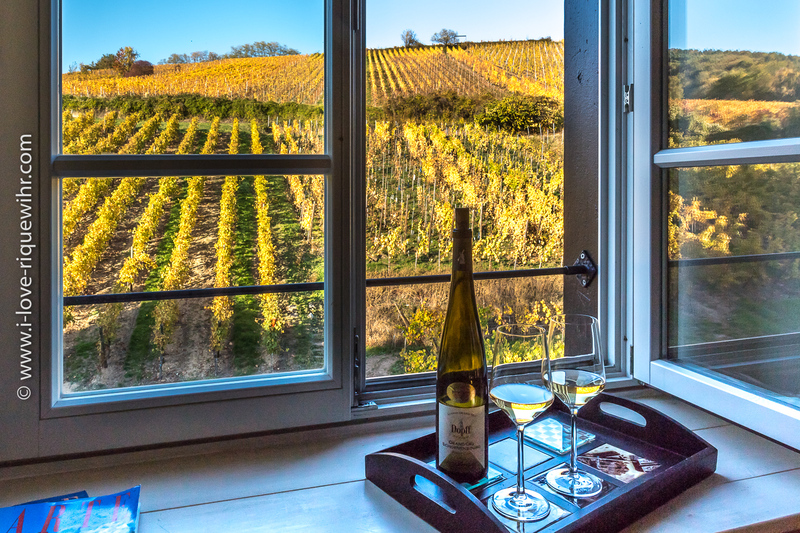 Watch out: from your windows, it is not uncommon to see the Fox sneaking between the vines! The Little Bear, Street level, ideal for people having problems with stairs.